Boston's George B. 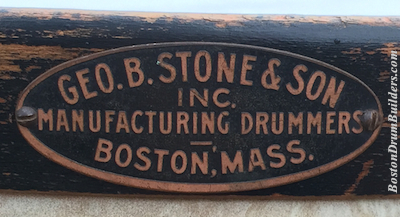 Stone & Son produced a great of drums in black lacquer finishes during the 1920s and into the 1930s. Most were either Master-Model snare drums or bass drums from matching drumsets. Much less common are black lacquered examples of the Separate Tension Orchestra Drum. 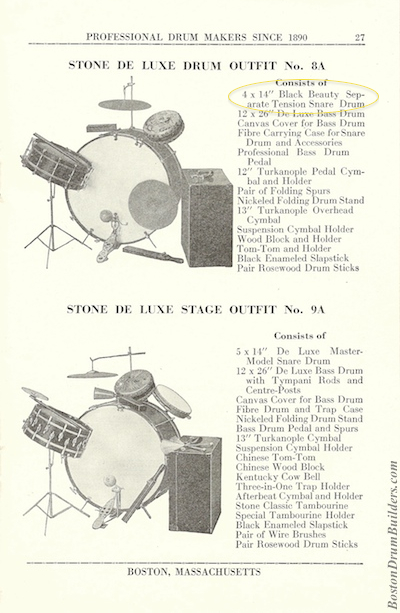 This model was in fact listed in Stone's Catalog K (1925) as the "Black Beauty Separate Tension Snare Drum". It is significant to note that Stone's use of the moniker 'black beauty' predates that of Slingerland by three full years. And this was SEVEN years prior to Ludwig using the term in their advertising. 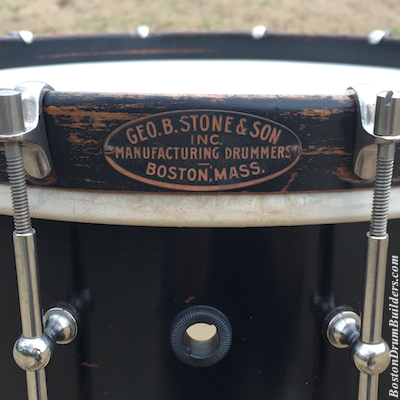 While Stone's Black Beauty was not an engraved metal shell drum like those of Slingerland and Ludwig, it was a high end model in its own right. 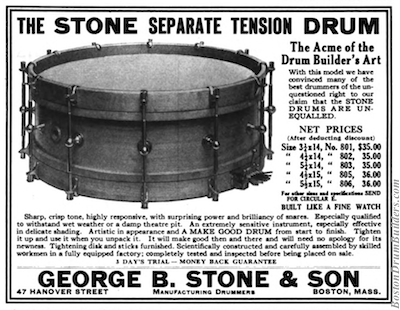 As was the case with all of Stone's Separate Tension Orchestra Drums after 1923, this drum was constructed around a 5/8" thick, three-ply maple shell with no reinforcing rings. 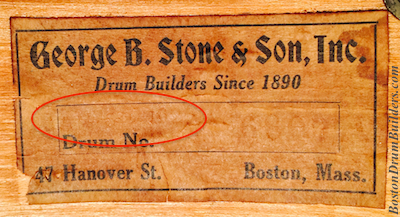 This was the same shell used for Stone's flagship snare drum, the highly recognizable Master-Model Drum after its introduction in 1922. It is quite possible that using the same shells for both the Separate Tension Orchestra Drums and the Master-models was a way to streamline production. Earlier Separate Tension Orchestra Drums, before the introduction of the Master-Model, featured thin one-ply shells with a trio of re-enforcing rings. This earlier shell design would remain in use through the 1920s on the larger dimension Separate Tension Band Drums. 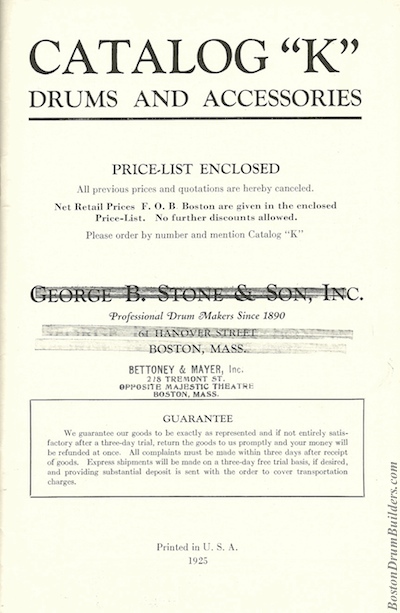 This particular example dates from January of 1925, as is indicated by the faintly legible date stamp on the interior shell label, and was one of the first to be adorned with Stone's bakelite grommet. 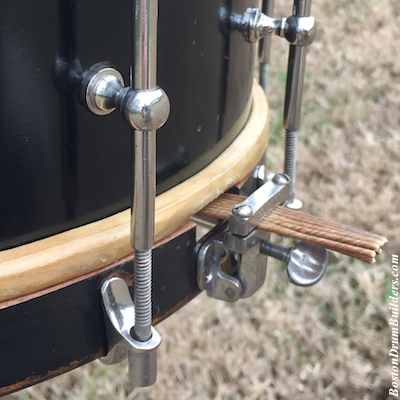 Earlier Stone drums were installed with rosewood grommets. 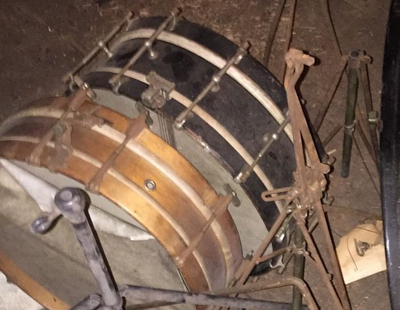 The transition from wooden grommets to plastic occurred somewhere between late November of 1924, and January of 1925 when this drum was manufactured. The badge seen here is that commonly installed on the top hoop of Stone snare drums. A very similar badge which lacked the "INC." lettering was in use until 1923. This drum is equipped with the Stone Patent Snare Strainer and Muffler as was typical on Stone's Separate Tension Orchestra Drums. Note that the strainer present on this drum lacks its original lever used to engage or disengage the snares. The drum is tensioned using twelve single post tube lugs which attach to the single ply maple counterhoops via slotted tension rods which pass through cast brass hooks. Stone's tube lugs, while elegant, are prone to cracking and are generally less durable than the double post tube lugs used commonly by Ludwig & Ludwig and others on snare drums of the same era. The shell measures 4 1/4" deep despite being listed in Catalog K at four inches even. Earlier advertising was more specific, listing the exact shell depth. Despite spending many years in a North Andover, Massachusetts barn this example is in fairly good condition and required no major restoration. The nickel plated hardware is surprisingly clean after a thorough polishing. The black lacquer finish shows its age but also shined up reasonably well. 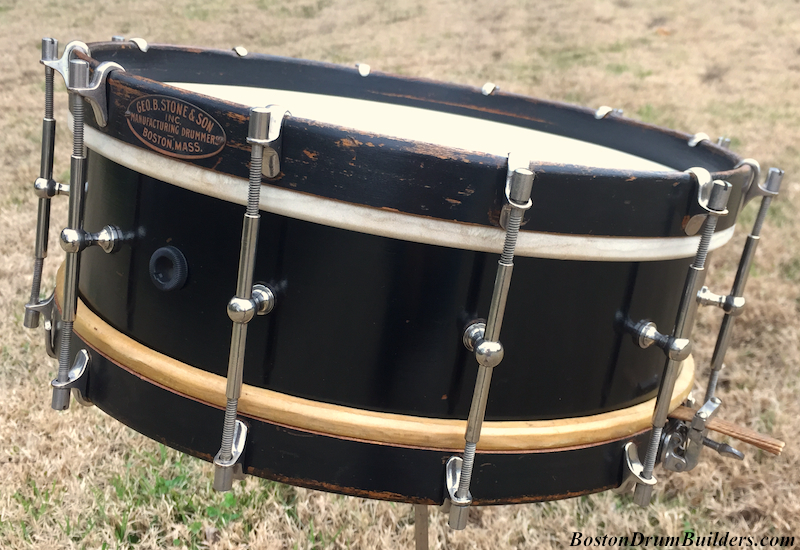 A new pair of calfskin heads and gut snares brought the drum back to period correct condition where it will be preserved for many years to come. Do you have a drum made by George B. Stone & Son? I'd love to hear from you! Feel free to send Lee an email anytime at lee@vinson.net.